Royal Classic Knight is designed and handcrafted with small breeds and puppy training in mind. This dog harness is safe for obedience training and professional K9 training. Nappa leather lines the breast plate and shoulder pad to protect pup's skin. Features adjustable girth strap and easy-release buckle. My dog, Rocco, has been using the harness for about a week now. It looks amazing and smells like a fancy leather handbag. It must be one of the most luxurious harnesses money can buy. Every time I walk the dog, my neighbors stop to admire his new attire! Because it’s leather and quite sturdy, I was initially concerned that it might bother him. The cushioning underneath helps him stay completely comfortable, which was what I was banking on. He wears his harness most of the day without any issue whatsoever. The only negative I’ve experienced so far was the initial fitting. Because he’s had his summer haircut, I needed to adjust the sizing to the snuggest settings for a proper fit. This took more effort than I anticipated because of the thickness and hardness of the leather. Again, an amazing harness and one I would highly recommend! I don't really think there have been any small dog customers for this product. When I opened the pouch, the first thing I thought was the leather was too thick for my boy. (He's only 5.5kg) It would've been nicer if it was a bit thinner. It would be great for big dogs though. The worst part is where the buckle positioned. It was right behind his right front leg. I let him wear it for 10 minutes, one of the softest part of his body got reddened and looked sore already. I had to got back home from walk and fix it. 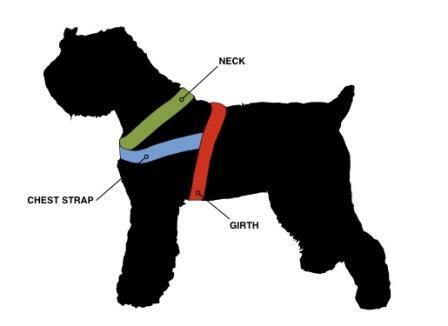 I recommend this harness to everybody! Great quality leather, nice product. Exactly what I am looking for! Love it!